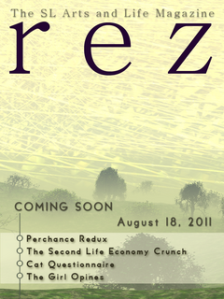 rez is a monthly arts and culture magazine, exploring the worlds of art, music, fashion, poetry, fiction, and the good life in SL and other virtual realms that can be explored by avatars. 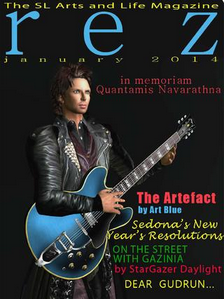 Since our first issue in August 2011, we've featured such artists as Bryn Oh, Desdemona Enfeld, Rose Borchovski, Claudia222 Jewell, Molly Bloom, Maya Paris, Suzanne Graves, and the best of SL's musicians and songwriters, including VooDoo Shilton, Loreen Legion, AMForte, Twin Ghost, Jordan Reyne, Stratakat, Donn Devore, Mulder Watts and many others, usually including insightful interviews, as well. Gudrun Gausman writes a monthly column, "What's Your Issue," and The Perfect Gentleman, Harry Bailey, contributes a monthly offering also. Microfiction whiz kid, Crap Mariner, gives us his irreverent take each month. We hope you enjoy reading it as much as we enjoy publishing it. Be sure to give us some feedback about what you liked, what you disliked, and what you'd like to see us explore in the future.